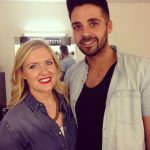 Backstage at XFactor with Tresemme: A week or two ago, I got to do something pretty out of the ordinary and exciting – I was invited to spend a day backstage with the TRESemmé team at XFactor. 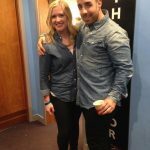 The team is lead by Jamie Stevens and week after week through the series they’re creating new looks for each of the contenstants before they go on stage for the live shows each weekend. 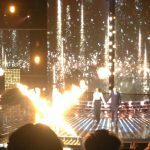 I should probably add here, I am a fan of the XFactor and do watch it, although not religiously – I thought I would totally be all cool/calm/collected when hanging backstage. Well, within moments of walking into the backstage area right behind Dermot O’Leary I realised that this cool/calm personality had escaped me for the week and I turned full on fan girl. Awkward. 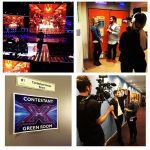 Whilst with TRESemmé backstage I wasn’t just hanging about, I was actually taking part in the filming of an exclusive VT with them and the contestants. Which basically meant I was playing presenter for a few hours and interviewing the contestants. This isn’t something I’ve done before but it was a lot of fun and just tried to go with the flow a bit. I’ve done a handful of on-camera interviews so tried not to be nervous…and also tried not to blush and giggle like a total school girl when interviewing Ben… a few of the snaps from the day are below and scroll down to have a watch of the full video (it’s only a few mins long) that we filmed. – Fleur’s hair is very much part of her signature look. 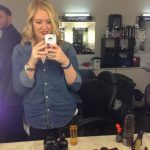 – Using the TRESemme wand to create curls – it’s a good tip for leave the ends out for a ‘less polished/more youthful’ finish. – Ben is very tall and absolutely lovely. – Stevie is a total flirt, witnessed first hand (not with me I might add…not sure if I should take this personally). 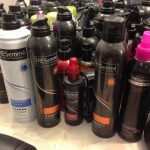 – TRESemme dust is a favourite of many a contestant. 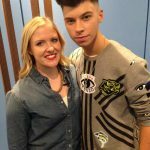 – The Stereo Kicks boys are not fans of Katie Hopkins. – Also, Stereo Kicks voices are amazing in real life – definitely don’t come across as amazing on TV as they actually were (bit late for them now unfortunately). 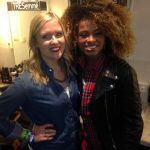 – Mel B is tiny in real life, and loves and animal print onesie. – Lauren is much taller in person than I thought she would be. – Simon Cowell does dress down – he arrived at the studio in joggers. 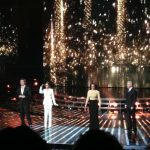 I had an absolutely amazing time backstage – it was quite surreal. 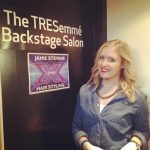 So thank you to TRESemme for having me, it was an amazing experience. Plus a special little shout out to Fleur, Ben and Stevie who were all lovely enough to let me film a little video of them saying hi to my nephews, who love the show. I got some major aunty brownie points for this – so thank you. Oh, and in case you’re wondering who I’m rooting for in the final – I am very torn! I think Ben is great and love the gravelly tone of his voice and think he would likely be the one I’d be most likely to buy his music. 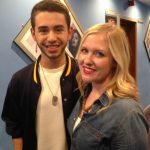 I think Fleur is amazingly talented and a proper ‘all rounder’, Andrea is adorable and has such an incredible voice. Lauren is lovely (plus has excellent hair) and is a true little pop star. It’s a tough call, but I think it’s between Ben and Fleur for me. What an incredible experience! Looks like you had a super time!